Traditionally undergraduates were the least important characters on campus. Mere revenue streams for other projects, colleges could simply let them in, pack lecture halls full of these kids, and concentrate all their research efforts on professors and graduate students. That’s revolutionary thinking for a university culture that has long focused on the inventions of graduate students and faculty. But campuses are beginning to put their bets on undergraduates. Who better understands the social media mindset? And what campus wouldn’t want an Instagram founder as an alum? 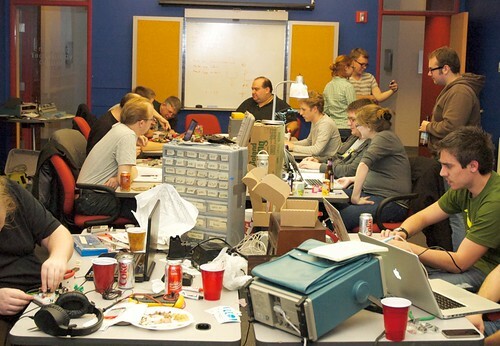 Campus incubators are growing. New data from the National Business Incubation Association show that about one-third of the 1,250 business incubators in the United States are at universities, up from one-fifth in 2006. Even nontechie campuses like Northern Kentucky University, Duke and Syracuse have jumped in the pool, recently adding or planning to add start-up incubators. George Washington University decided to offer “soup-to-nuts support” for start-ups when it created the Office of Entrepreneurship two years ago, with workshops on crafting an elevator pitch and talks like “Student Start-Ups: From Dorm Room to Board Room.” Jim Chung, the program director, notes that today’s start-ups are led not just by business and computer majors but by “designers, musicians, anybody with good ideas,” so universities need to connect these students to experts and to one another. Most universities don’t really know how to do this very well but they’re going to have to figure it out. Technology entrepreneurs are the hottest new capitalists today. These are the people many students come to college to become. Colleges are going to have to do what they can to make this happen.